Not having been out and about photographing for the fun of it for a while the thought came to me a while ago that I’d like to give another go at doing some IR photography. I’d bought a Cokin IR filter a while ago and so had the kit already. 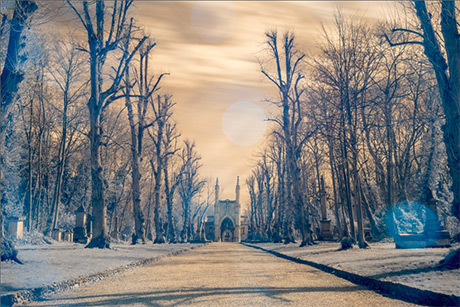 Also – living close to it but never having visited I thought that Nunhead Cemetery would be a good spot – Graveyards always look good in IR. If you’re not interested in techie photography ramble and explanation – just jump to the end to see my photos. The problem with trying to shoot Infrared with standard D-SLRs is that in front of the sensor they have a IR/Low-pass filter. Although it doesn’t block ALL IR light – it blocks much of it. So if you’re not going to go to the effort/expense of converting a camera and taking this out – you need to use an IR filter, which only allws IR and near-IR light in, and have a fairly extended exposure time. There are numerous filters on the market – I just happen to have a Cokin P-series filter. I bought this a while ago as the advantage of Cokin filters is that you buy adapter rings for the holder and so you can use the filters (panes of glass) for different sized lenses – thus saving on the expense of buying multiple filters. At the time I invested in this system Cokin were only doing A and P-series filters – A being small and P larger in size. They now also have Z and X series which are even larger. P-series are rated up to 82mm – but there are issues when shooting wide-angle lenses. Reading up online it seems that the Cokin filter isn’t the best of the IR filters available commercially – but it’s the one I have. Sometimes they’re rated in terms of light frequency they will block. So – I have a D-SLR with a filter to cut out IR wavelengths, and in front of it I have a filter to only allow IR in. This means that exposure times need to be quite long to get enough IR light to give a decent exposure – hence using a tripod and remote shutter release to reduce/stop any camera movement. I found that when shooting wide-angle alas the Cokin filter holder would cause a vignette – although shooting IR and the camera warm – the Vignette would be light rather than dark. Eventually I changed the camera setup so that it would shoot after a Mirror lock-up just in case that cased vibration. After a while (it was light out – seeing the LCD screen wasn’t great) I realise that there was some lens flare happening on the filter. Due to the filter holder I was unable to put a lens hood on. Additionally – because there is a slight gap between the filter and the lens – the lens flare (or filter flare) was even happening when pointing away from the sun – the sun was getting into this gap. So I would stand in-between the sun and the camera. However thinking it might be interesting – I also took shots allowing some flare to happen. Focusing : Because the IR filter is so dark – the camera has no way of focusing using traditional methods – so you have to focus before putting the filter on. Check Picture on LCD. However this was hard to judge in the light so often viewed the histogram and trusted this. Repeat with exposure changes, and sometimes compostion/orientation changes, and on occasion – allowing flare. Of course – these values will vary for other cameras depending on their IR sensitivity and the amount of IR light/heat etc. LCD Loupe: It would have been handy to have a LCD loupe (e.g. Hoodman Loupe) to be able to see the results on the back of the camera. White Balance: After reading sites online on how to process IR images I realised that I should have, or at least tried to, set a white balance on the camera. With IR filters a little red light still comes through and so pictures usually appear with a red tint. It seems it might be possible to remove this using a custom white balance. It obviously won’t be the standard light colours but should be more interesting than just white. More of this in Processing section. Focusing: Have read somewhere that focusing should be done differently from my method of focusing without the filter initially – the reason being is that the IR wavelength is significantly different from visible light. Not sure how much of an effect this is. I did notice that if I switched to live-view that the LCD did actually show an approximation of the picture I’d get rather than just dark red! So maybe live view may have done a better job of focusing. In the past I just converted IR photos to simple Black and White images, probably through Photoshop. However I thought I’d look up alternative methods – or at least the best way of doing it – possibly within Camera Raw – this lead me to all kinds of options – and included the tip about White Balance I mentioned above. As per so many other things with digital photograph editing – there are SOOO many ways to edit things and so I won’t go into the options here – instead I’ll just cover what I did. In the past I’ve accepted the fact that the picture will look totally red because of the near-IR light getting in through the filter. 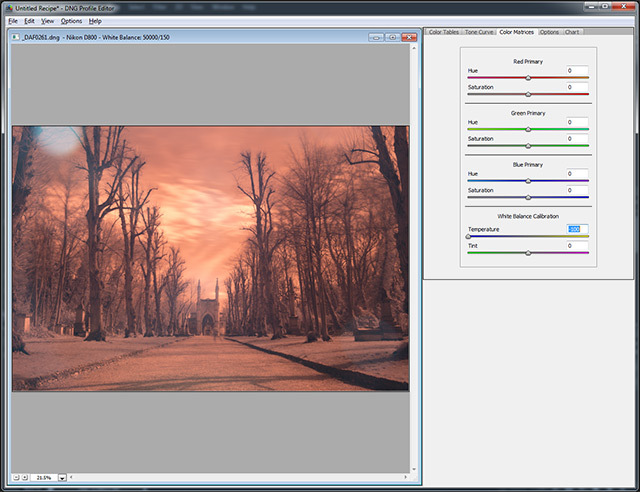 However various guides online suggest it might be possible to set a custom white balance to correct for it in the camera – possibly using Live View. However….. I didn’t do this. So the usual way I set white balance is with Camera Raw – however within itself Camera raw isn’t sufficient on this occasion – the slider will only go so far – not far enough to correct for the VERY red picture. So this calls for an additional process. Some online guides suggest using an alternative RAW converter but another couple I read pointed at the method I eventually used : Creating a DNG profile, applying this first, then using Camera Raw’s own White Balance correction. 1. A create a DNG file. You can convert one of your RAW files to a DNG file using Adobe’s. There’s one for Windows, and one for MAC. It’s free but you need to register with Adobe and get a AodbeID. 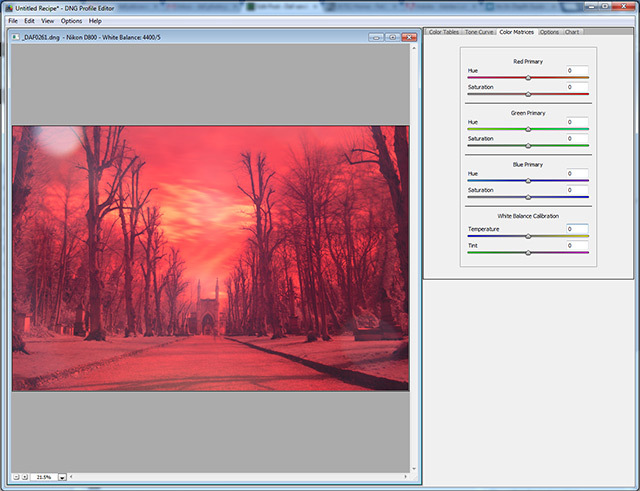 Creating a DNG file is fairly straight forward. To create a profile I used Adobe’s DNG Profile Editor. Again free if you have a Adobe Labs ID, or after you register. 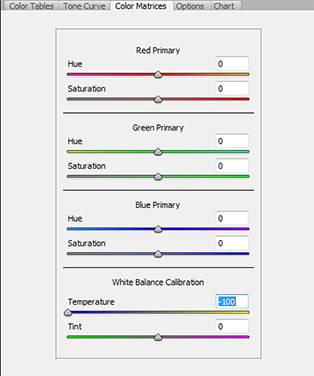 Move the “White Balance Calibration” setting – “Temperature” slider all the way to the left. So the red picture turns more orange. Export the Profile using “File -> Export” to the Camera Profiles folder of Adobe. Initially it selected the correct folder for me but trying just now it didn’t. On Windows 7 this is : C:\Users\<USER NAME>\AppData\Roaming\Adobe\CameraRaw\CameraProfiles\ Using a name that represents it’s use i.e. for IR. Also the picture pre and post doing this. See profile: Nikon D800 IR Recipe. After that the picture in camera RAW looks orangey. 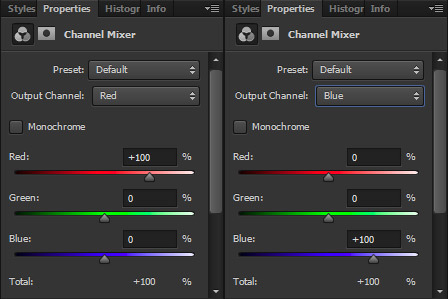 You can then use the White Balance sliders as normal – or the white balance sampler tool. Depending on where you sample this will turn parts of your image orange, and parts blue. To get the most of the image. Then open the image into Photoshop. 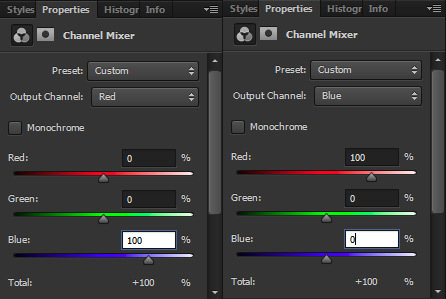 A lot of blogs/guides then suggest swapping the red and blue channel. Not sure why – but this just works – maybe because it has a tendency to turn the sky blue rather than orange – which makes sense to our unconscious mind. There were a couple of images that I didn’t do this to – they just seemed to work in their original state. Then continue with your other editing. And so finally – my pictures. As mentioned above – these aren’t perfect – some have accidental lens-flare and some are on purpose – as after all I think it looks quite nice. Click on them to see a larger image. This is an important blog post which I’ve meant to write for a while – a story of woe and near disaster. I hope others will see it and avoid such a situation. Please feel free to pass on or link on forums etc. In brief – it’s about RAW files being downloaded via an old copy of Nikon Transfer (part of Nikon View NX) Corrupting RAW files from the D800! On large shoots away from home (Weddings, Festivals, Collaborative shoots) I tend to shoot a lot of pictures. During most of these I shoot RAW files and as such even with a large 32Gb card it can fill up. Although I have smaller other cards sometimes these aren’t enough and so I copy files from the card (using a card reader) onto my netbook. 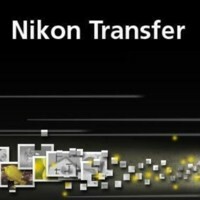 Instead of just copying them – I’ve been using Nikon Transfer which is part of View NX. Hadn’t been doing this for any special reasons although there are advantages e.g. 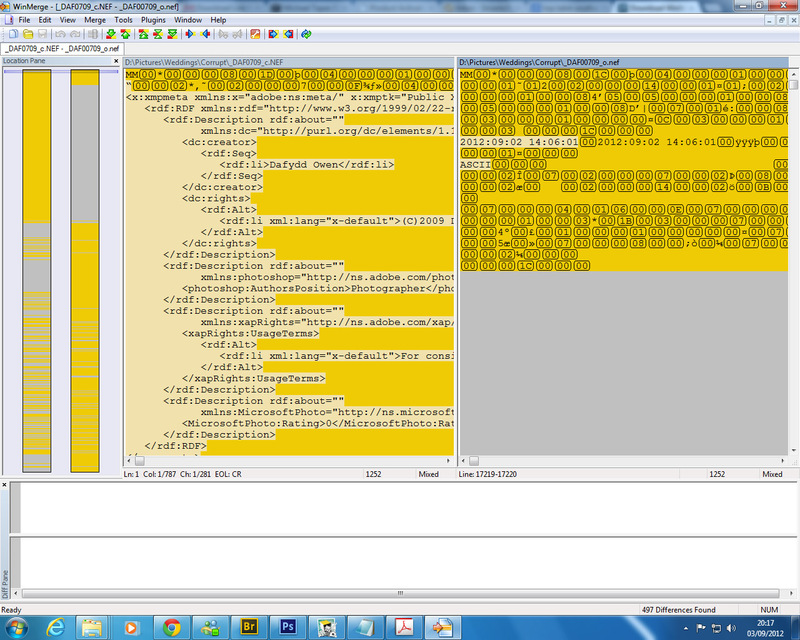 it can embed additional Metadata. Without realising it – I was running an old version of Transfer/View NX – not sure now but I think it was version 1.85 while the recent version was approx 2.5. On downloading the images to the netbook local hard drive (using the Transfer application) the previews were appearing in ViewNX just fine, and I previewed one or two and they looked Ok. So after downloading the whole card I formatted it and used it again (after using some other cards). On returning home I copied the files over from the netbook to my desktop using the home network just using standard file copy. Opened up Bridge to view them – no go! Bridge couldn’t see them! It said they were not in a correct format. Went back to the netbook and viewed them in ViewNX (no bridge) and they seemed fine. Tried to copy again – no change. Then opened up ViewNX on the desktop – and I could see them there BUT on opening them fully – ViewNX reported them as only being 1632 x 1080! From a D800 they should be 7360 x 4912. I couldn’t understand why ViewNX could see the images (but report them as being small) while Bridge and other applications couldn’t see anything. I did some online searching and found other people who had run into the same issue – it pointed at the fact that an old version of Transfer had copied over the RAW happy as Lary but significantly corrupted them in the process! Some people said that the files were a total loss (NOT an option for me as this was a paid one-off event!) while others did point at various possible solutions. In connection to this I tried checking to see what kind of damage the transfer application did – I had RAW files on cards so copied one just using file copy, and again using the erroneous Transfer application – then compared the files using a file comparison application I use sometimes with coding. Alas they were drastically different – it wasn’t just the header of the file which had changed! I find it quite shocking that Transfer would do this. Flash card recovery : Even though I knew there was no chance of getting ALL corrupt files back since I had formatted the card and started to re-use it again – there was a chance that I could recover some of the corrupt RAW files. So I installed a current copy of the RescuePro application that comes with Sandisk Extreme cards and gave it a go. And thankfully – it managed to recover quite a lot! The Card holds about a thousand RAW files. I had formatted and re-used the card to about half way – and so I was able to recover about half the RAW files from the formatted but un-used card – woohoo! The code that comes with the card is not in fact the license key – it’s just a code that you have to enter on a website. They then send you the true license key shortly after. Yes I wasted quite some time trying to enter this as the license key! Once validated the licence key is only valid for 12 months. Therefore a previous key I had no longer worked. As such – don’t install this application as soon as you get a card – keep the Serial ID safe and only use to get a license key once you really need to us it. Copy small (1632 x 1080) images : This wasn’t really an option which I wanted to consider. although technically “HD” they wouldn’t be remotely close to the full res. However I was having dread thoughs of having to take a screen-grab of ViewNX preview to use in Photoshop! “I am really sorry to learn about your problem with D800 files and old View NX. Older Nikon software released before the D800 does not have correct algorithms to recognise the new RAWfile format. Upon transferring it saves some information in an incorrect place, effectively damaging integrity of the file. The issue does not exist with the version distributed together with the camera or newer. There is a way to recover full-resolution JPEG previews from the damaged files – they are quite highly compressed so you can see some artifacts (especially in detail-less midtones and shadows), but the quality should be sufficient for most purposes. Please note this is not a official Nikon procedure, however it worked successfully for few other customers that had the same problem. Also, as the IJFR application is not our product, we cannot take any responsibility should it cause any problems. 5. A separate folder will be created, containing the extracted previews. The link they gave was to Nikon View NX 2.5, but I have an updated one below. Also note above app link is currently dead but I list more below. For the files that were still on the formatted memory card but not written over – RescuePro recoverd the original RAW files. For those I could not recover: So it transpires that in addition to a small thumbnail image (as is saved in some jpeg files) the RAW files contained a full resolution preview! Alas this was heavily compressed but thanks to the D800 36Mpx this was minimised for web images. While jpeg files for the D800 usually come out at 5-20Mb these files were 1.5-3Mb. Of course I would loose the editing advantage of RAW files – but a full res jpeg is better than nothing! Even future-proofing isn’t straight forward! 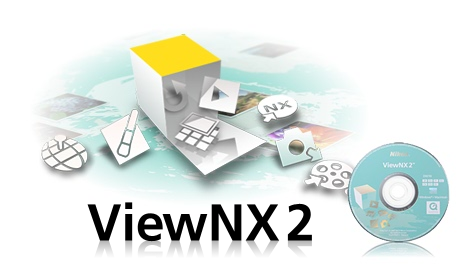 It seems that if you have an old version (pre 2) of ViewNX and Transfer installed then just updating View NX will not fix the issue! It seems that it doesn’t always replace the old Nikon Transfer – just installs the new one alongside. So if you have shortcuts just pointing to Transfer (as I did) then you could still run into this issue! So my suggestion is to totally un-install Nikon View related software (+ Transfer) and then do an install of the newest version from scratch. And of course – I will now. But I am also considering not using Transfer – why would it need to change the RAW file at all other than maybe adding data to the metadata. really not too sure about that. So that’s it – hopefully this article goes through the internet ether and is noticed by people with modern Nikon Cameras who may still be running the older versions of Nikon Transfer. Or failing that – those with corrupt RAW files who haven’t found the solution. Yesterday I did a job for Brad and Ian at Materials Council and Architronic at their stand at the Super Brands London exhibition – part of the London Design Festival. It involved photographing their stand and the surrounding area in the morning before the public turned up and then coming back in the evening for the opening reception. White Balance – With mixed lighting (white light panels above, and more orange Tungsten not far away) then white balance is something to keep a close eye on, especially since the title of the display has the word “White” in it – wouldn’t be great if everything was orange! The obvious get-out for this is to shoot RAW and choose the White Balance later in post production – so this is what I did. Exposure – When you get a viewfinder full of white – and if on some camera automated exposure mode there is the danger that the camera will under expose the white to get it averaged out for middle gray. There are different techniques to counter this – and I used a mix depending on the scenario. When steadily photographing the white material – going up and down the display I switched the camera to manual and set the exposure myself. The lighting on the display was fairly even so this was made possible. At other times when moving around photographing people around the display etc – I generally used Aperture Priority set to 2.8 for nice shallow depth of field, but set the camera to exposure compensation of +1/3. This could on occasion be not enough, or too much – but since I was shooting RAW this gives more leave-way to change the exposure later on. With post production the trick is to get the material to be white, but not blow-out the details. Also while shooting and editing the old term of “expose to the right” applies i.e. exposing so that the historgram sides to the right – more white, but without over exposing. The point of this is that making things darker in photoshop etc tends to be better than making them lighter – as noise etc becomes more evident then. Here’s a quick selection of the opening night. Got in rather late but edited a quick few for their newsletter today. Materials Council Coverage of the opening day. I took a few pictures of some of the areas – and will upload a couple of pictures later on. In collaboration with Super Brands London – the Tent London show is going on at the same time in another part of the venue – The Old Truman Brewery in Brick Lane. I was quite surprised to see this as it was upstairs and a LOT bigger than I expected – it was huge. As far as I can tell – Super Brands was for the larger more established designer companies, and then Tent was for the smaller companies – either starting out or still relatively small scale. Unfortunately – as I was working I didn’t really have the time to photograph them but there’s plenty to see. If you’re into interior or furniture/fittings design and free over the weekend – I highly suggest going. Mind you – open House London is also on this weekend. Entrance for Super Brands/Tent London is £8 in advance or £10 on the door for adults. Less for kids etc.